SSCSR Recruitment 2017 Notification published recently by the Staff Selection Commission, Southern Region. Apply online for 61 SSC Southern Region Recruitment 2017 on or before 24th September 2017. Read the Southern Region SSC Notification 2017 for the eligibility criteria. Furthermore, details such as SSC SR Vacancy 2017, Staff Selection Commission SR Jobs Eligibility are provided here in detail. Applicants can find the SSCSR Group B & C Online Application 2017 @ www.sscsr.gov.in. Good News!!! Recently, the Staff Selection Commission has come up with the New Advertisement for the appointment of dynamic candidates. 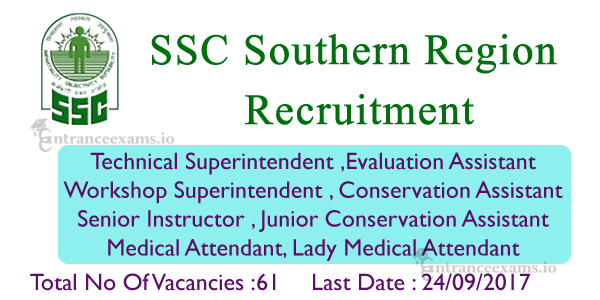 The SSC Southern Region Notification 2017 was published for filling 61 Medical Attendant, Junior Conservation Assistant, Superintendent posts. Hence, willing and interested candidates can apply for the Latest Job Vacancy in SSC Southern Region 2017 before 24th September 2017. According to the official notification, applicants should satisfy the Educational Qualification and age limit specified by the Board. For the candidate’s convenience, here we have enlisted the complete SSCSR Recruitment 2017 details such as Pay Scale, Selection Criteria and others. So, take a glance at the below sections to know more about the SSC SR Notification 2017. For Medical Attendant Posts: Postulants should pass 10th class from the recognized board. Plus, aspirants must have Certificate in First Aid from the State Govt/Central Govt Recognized Institute. For Technical Superintendent Posts: Applicants have to complete Diploma in Handloom Technology/Textile Technology from the recognized Institute or University. Check the Academic Qualification according to the posts in the Staff Selection Commission Southern Region Notification 2017. The Staff Selection Commission will accept the online applications from the candidates whose age between 18 to 30 years. Aspirants have to check the SSCSR Notification 2017 for the detailed age limitation according to the post. Individuals who applied for the Staff Selection Commission Recruitment have to participate in the below rounds. The organization will pay the good salary for the candidates based on their post they are recruited. So, refer the official advertisement for the detailed salary details. The General and OBC contenders have to pay the application fee of Rs.100/-. While the reserved, female, and PHD candidates are exempted from the fee payment. Commencement of online application: 25th August 2017. Final date to apply online: 24th September 2017. Last date to post the print out of online application: 3rd October 2017. First of all, aspirants have to visit the official web portal of staff selection commission, Southern Region i.e., www.sscer.org. Read the SSC SR Recruitment 2017 Notification carefully available on the homepage. If you satisfy eligibility, click on the SSC Southern Region Recruitment 2017 Apply Online link. Fill up the online application with the correct information. Upload the scanned photograph and signature within the specified dimensions. Make payment as per your category. At last, submit the online application form. Download and take one hard copy of the SSC Southern Region 2017 Online Application. Finally, aspirants have to post the online application form to the below postal address. As per the official advertisement, we provide the complete details of the SSC SR Recruitment 2017. If you require any other information, please refer the official Southern Region SSC Notification 2017. Keep visiting this www.entranceexams.io website for the Latest Government Jobs Updates.